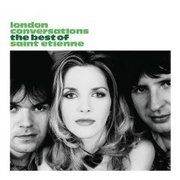 If ever a band was qualified to write their own history, it's Saint Etienne. Not only is London Conversations their fourth compilation, but, in recent years, co-founders Bob Stanley and Pete Wiggs have also raided the vaults to assemble retrospectives of Dusty Springfield, Glen Campbell and Burt Bacharach. Little wonder, then, that this double album of 35 songs – compiled by completists, for completists – serves as a 'How To' guide to assembling a career-spanning album. Packaging instantly recognisable and as stylish and artful as the tracks within? Check. Sleevenotes, by Jon Savage no less, intelligently placing the band in context? Check. Tracklisting rounding up the early hits while neatly distilling the second, less chart-bothering half of the band's 18-year career? Check. A new song or two for long-term fans, plus a hard-to-find track – in this case 'Lover Plays The Bass', available on CD for the first time here? Check. If all this makes the whole venture sound almost clinical, it's an accusation easily thrown at Saint Etienne. But that's to miss the point. From the baggy-meets-Balearic sound of 1991's debut 'Only Love Can Break Your Heart' through incursions into Northern Soul and Techno, via proto-Britpop, to recent collaborations with the Xenomania hit factory, Saint Etienne have always produced a carefully crafted dialogue between a nostalgic delight in (and archivist's knowledge of) pop culture's golden age(s), and thoroughly modern production. Few lyrics better encapsulate the devoted music fan's singular slant on the world than 'Hobart Paving's “Rain falls / Like Elvis tears” – everyday events viewed through a pop-culture prism. 'Finisterre', a blissed-out groove from the soundtrack to their 2002 film of the same name – itself a London Conversation between the sprawling metropolis and the folk who, in the eyes of Saint Etienne, define it (from Mark Perry to Earl Brutus's Nick Sanderson to Lawrence from Felt / Denim) - is little short of a manifesto. The band pledges allegiance to Donovan, Electrelane and getting lost in the city in a gem of a song that stands comparison with any of the better-known tunes on disc one. Yes, there is little here that long-term devotees – and there are plenty of them – will not have already amassed over the years, but this is a comprehensive history of a band that believes in the art of pop. And for this, we should cherish them.